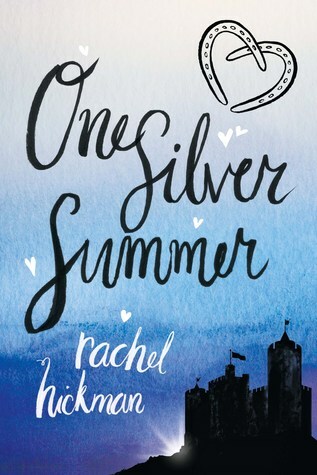 We're excited to have Rachel Hickman stop by to chat about her debut novel ONE SILVER SUMMER. Rachel, what was your inspiration for writing ONE SILVER SUMMER? Love. I hope that doesn’t sound sappy, but it’s true. Love in all its wonderful and confusing forms. This story is about place: my love of a wild and rugged English seacoast called Cornwall. It was written in a tiny hamlet called Portloe on a terrace that looked out on the ocean. It reflects my life long passion for horses and horse stories that began with 1950s horse and pony books from the library of the Ladies Recreation Club in Hong Kong. Then my later love of my own horse, a thoroughbred event horse called Munch who died sadly last autumn. And a new love in the shape of a bouncy newbie called Miss Marble who arrived with us this winter. It’s the steadfast love I feel for my family and our history through the generations. And all the heady passionate hair-wrenching heartbreaking stuff that is still as clear as day in my head from when I was teenager. I even married my first love who I met at eighteen (30 years ago). Finally, it’s chock full of favorite things: riding on a beach, castles, tiny churches, crazy Patterdale terriers, Tiffany silver horseshoes, old Bentleys, Earl Grey tea, abandoned horseboxes, The Plaza Hotel, New York, the Wizard of Oz, Nancy Drew’s titian hair, wild storms, walled gardens. And how my best friend next door when I was fourteen grew up and married (and then divorced) a Danish prince. What do you hope readers will take away from ONE SILVER SUMMER? I want readers to be swept up in a gorgeous, sweet and horsey love story that’s set on the most beautiful seacoast in England. I never set out to write something important so much as emotional, escapist, well told, I hope – and just a little bit glamorous. It’s a fairytale of sorts, romantic in the old sense, but gutsy and modern in the attitudes of the lead characters. For me, reading and dreaming have always gone together like fish and chips – and that’s what this book is. In my day job, I’m a publisher in England with Chicken House, so this question is either a cinch or a nightmare, I can’t decide. Nor can I claim to be as good as these authors, but all of their books inspired me to write my own, and I think we share something. FRENCHMAN’S CREEK by Daphne Du Maurier; I CAPTURE THE CASTLE by Dodie Smith; I’LL GIVE YOU THE SUN by Jandy Nelson; ANNA AND THE FRENCH KISS by Stephanie Perkins; ONE DOLLAR HORSE by Lauren St John; FLAMBARDS by KM Peyton. THE SECRET GARDEN by Frances Hodgson Burnett. SENSE AND SENSIBILITY by Jane Austen. THE LIGHT BETWEEN OCEANS by M L Stedman. EVE GREEN by Susan Fletcher; A MOMENT IN TIME BY H E Bates; DARKMERE by Helen Maslin. Rachel Hickman is the co-founder of Chicken House, the acclaimed children's book publishing company. She lives in Hampshire, England. One Silver Summer is her first novel. Have you had a chance to read ONE SILVER SUMMER yet? Do you pull from your love of a variety of things to inspire your writing? Do you feel reading and dreaming go together like fish and chips? Share your thoughts about the interview in the comments!